Monosyllabic Avenger (bearded, jut-jawed Guy Pearce) drives up to a middle-of-nowhere bar to mutely wash his neck, when three inept bandits crash their truck and steal his car. With some ease, the M.A., called Eric, extracts the truck the bandits left and Road Warriors–down the three bandits. They pull over for the parlay, and knock Eric over the head—but don't do the common sense thing of killing him and taking his car. Shortly afterward, Eric finds the gut-shot brother they left behind, a Faulknerian idiot named Rey (Robert Pattinson using a spastic honk that seems to be a tribute to Billy Bob Thornton in Sling Blade). In cold pursuit, Rey and Eric drive to the Flinders Range where there is a physician of sorts, a lone woman doctor (Susan Prior). Thence to the well-worn trail of vengeance. 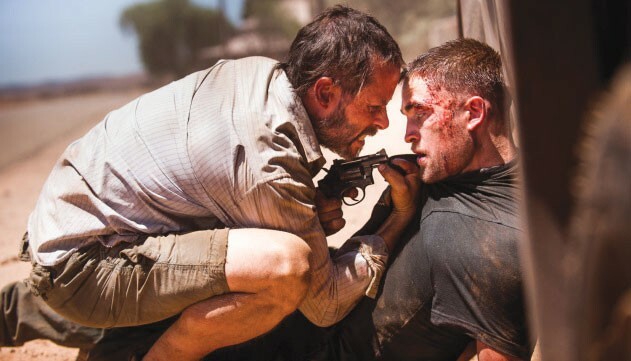 The Rover throbs with nativist fears that don't quite rattle our Yankee bones. The gawk-worthy visuals do capture the heat, dust and terrible remoteness, but when comparing this, as some have, to Austrailia's classic 1971 Wake in Fright, note the lack of savage pleasure in The Rover; The Road Warrior looked like the end of the world, but it also had jokes, like when the gyro-pilot asks "Remember lingerie?" The only humor in The Rover is the dark, mirthless anti-joke hidden in the title. All the bloodshed is due to something that isn't valuable in the ordinary sense, except in a demonstration of the principle of the thing. Common sense takes a holiday. Blame The English Patient and Cormac McCarthy in equal measures. 'The Rover' opens June 20 at Summerfield Cinemas, 551 Summerfield Road, Santa Rosa. 707.522.0719.